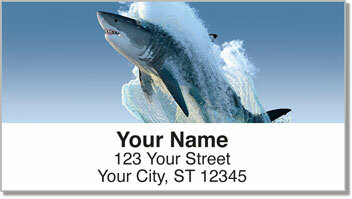 These striking return address labels bring you face to face with one of fiercest creatures in the sea! We are fascinated by sharks because we fear them, because we are in awe of their power, because they remind us that we're not quite at the very top of the food chain. You'll find a variety of shark species featured on this unique set of wildlife labels, from the Hammerhead to the Great White. It's a design you can really sink your teeth into! 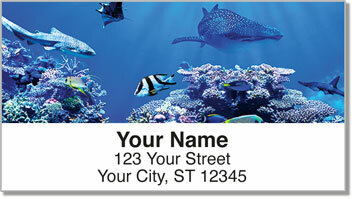 Stick these sharp-looking labels on every piece of mail you send for a finishing touch that's quick and easy. 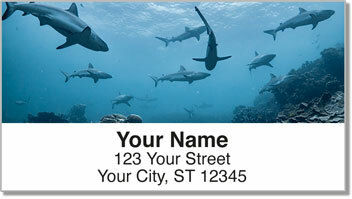 A self-adhesive backing means you'll never have to scribble out your return address ever again. 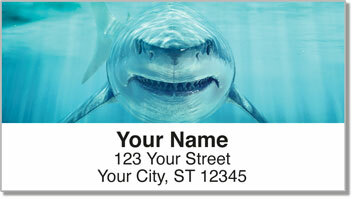 Order your very own Shark Address Labels today! You can also get a set of matching checks.